How do you know that you have developed an effective relationship with a mentor? A faculty or staff member knows you well enough to write a letter of recommendation for you. 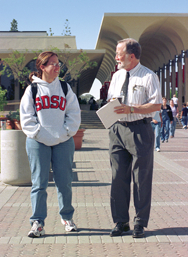 You have someone with whom you can discuss your questions about your major, career, graduate school or life. You have someone whom you can trust, and someone who challenges and inspires you to personal and academic excellence. You and your mentor touch base on a regular basis. Your mentor has provided you with information and/or advice related to your academic and/or career interests. Your conversations with your mentor help you feel more confident about your ability to make decisions related to your academic, personal and/or career goals. How do you know that you have been an effective mentor? You have connected your protégé to faculty and staff members on campus related to your protégé’s areas of interest. Your protégé is knowledgeable, and has taken advantage of campus and other resources related to your his or her major and career interests. You serve as a positive role model and challenge your protégé to aspire to personal and academic excellence. You touch base with your protégé on a regular basis. Your protégé knows what campus offices provide academic, career and/or personal assistance and support.